My goodness. This Kurt Adler Christmas ornament is $65! It’s designed by David Strand. And measures over 6 inches tall. 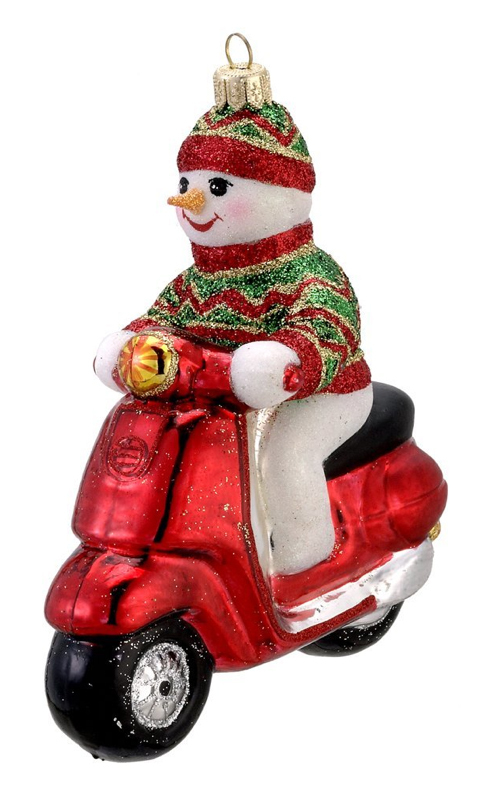 But this ornament is priced like a Radko! Still it is the first snowman on a scooter I’ve run into. Except for this guy. And he’s much too big to hang on a tree. The oversized sweater ($54.99) is a new edition to ModCloth’s arsenal of scooter goodness. The skirt ($64.99) we’ve covered but it seems to be back on ModCloth . . . for now. They don’t carry tons of stock so don’t dilly dally. Remember the Truval shirt ad from earlier this week? Well here’s a shirt that would not look out of place in that same ad. 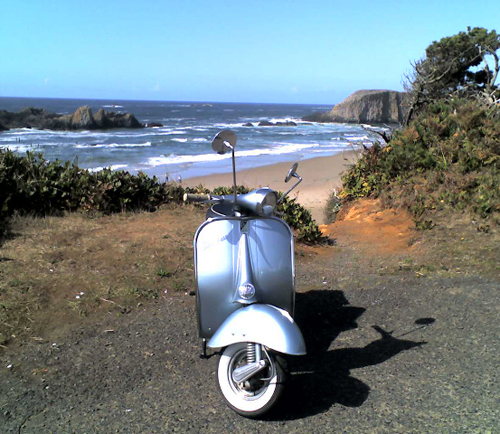 It features little Lambrettas, little Vespas and (I think?) little Fiats. It’s 100% cotton with a chambray collar and costs Â£24.95. Sizes run from S-XXL. Thanks to Alice D. for this find! Here’s a vintage 2-part hand-tinted postcard for you! 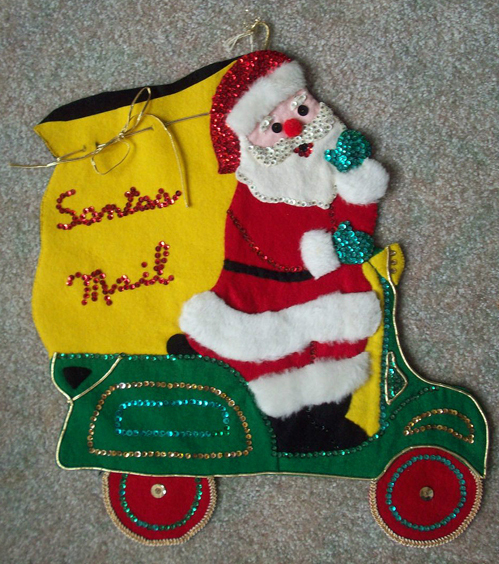 Spotted on eBay awhile back, this large vintage handmade Santa riding a scooter was probably a Christmas Card holder in someone’s uber cool 60’s era home. A definite idea for you crafters out there. Happy Fourth of July everybody! 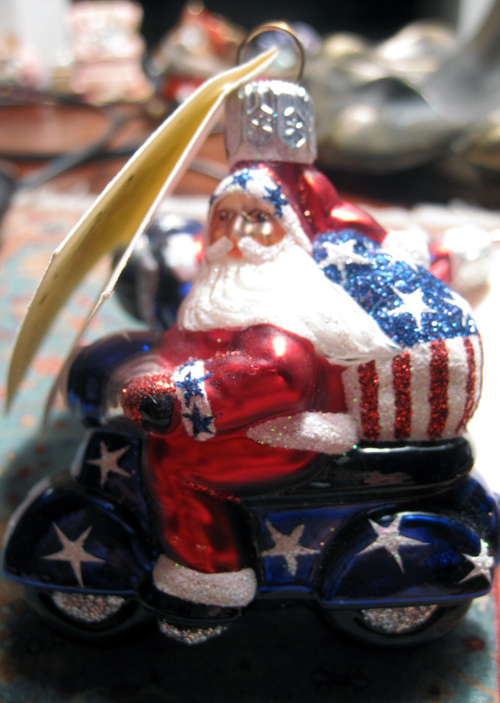 Here’s an ornament I spotted on eBay but can’t find a source for. Maybe some of you will have better luck? Here’s a vintage board game with the most incredible playing pieces. Anyone speak Italian? Not on the high street. Here’s a whole slew of scooter goodness for you from the online UK retailer “Not On The High Street.” They have a selective application process for sellers and want only the unique and well-made. They are especially interested in supporting small British businesses â€” both designers and manufacturers. And it’s easy ordering for us Yanks. 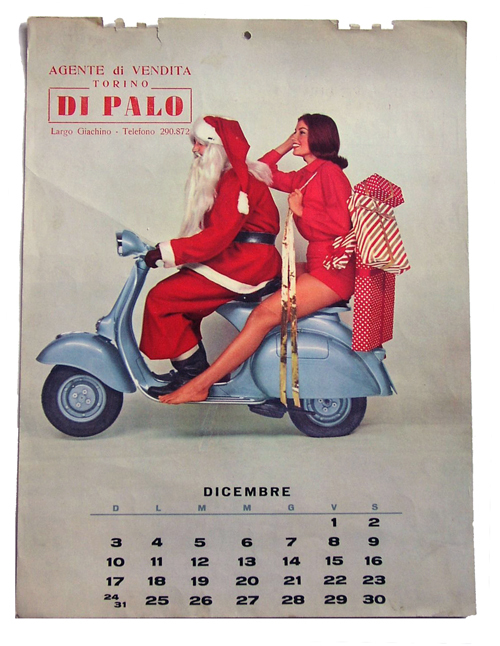 I especially like the scooter girl wallets/clutches and the two-wheel sprint scarf featuring both bicycles and Vespas.